disinformation or misinformation or pushing the bitcoin or.....causing collapse on purpose? All of us who paint, paint in a context. We either paint in Western traditions, or Eastern traditions, Oriental or African traditions, and so on. We do not paint in a vacuum. We may choose to depart from centuries of symbolism, but we cannot entirely do that without destroying history, symbolism and imagery. The desconstructionists and post-deconstructionists do this in philosophy and linguistics-destroy the meaning of word and, therefore, destroy context and the search for meaning. There is no artist who can create something "new" as only God can create out of nothing (poesis), while artists only imitate (mimesis). We, creatures ourselves, "make" art which is already in the mind of God. Now, there is demonic art, as well as good art. There is art which is pornographic, violent, and prurient. There has been in my lifetime many examples of blasphemous art. One thinks of the horrible statue of the Holy Virgin Mary with elephant dung as part of the depiction. It was rightly declaimed as rude and an insult to Catholics. The use of fetuses in art in England when I was there almost thirty years ago was another example of "statement art" which was horrible and most likely satanic. But, Christian artists can make mistakes, gross errors of judgement, by ignoring the symbolism and imagery of the last two millennia. David Jones wrote of "The Break", the time in the early Twentieth Century, when art was separated from Western symbolism. I found this to be true when I was teaching a class on the literature of the Holy Grail. Some students did not know what a chalice was, what the word meant. They knew only the word "cup". The great symbolism of the Holy Grail cannot be taught without context and the same is true of reading Dante, or Eliot or Jones and many others. When an artist paints Christ or Mary, there are hundreds of clues which one can read which are like shorthand, telling us the meaning in a painting. Icons are full of these clues. To ignore or purposefully distort these ancient images and symbols indicates a Protestant or secular mindset. Why show the Wedding Feast at Cana with customs which were not known at the time, or without the traditional symbolism? Why attempt something new just to seem trendy or to supposedly "appeal" to modern, contemporary life? We do not learn anything about Christ and Mary out of context. The Scriptures give us the context. They were Jews, living in a very ordered and stratified culture, plus enduring Roman civilization and conquest. For example, to depict Our Lady as controlling the entire event of the changing of the water into wine misses the entire point of the event. "Do whatever HE tells you"....Not, "Do whatever I tell you." Mary would have not be prominent after Christ entered into the action, and the older paintings which show her in the background or off to the side make this point. Small hints in a painting or drawing point to truths and realities of the mind, heart and spirit. I can tell a modern Protestant painting of the Baptism of Christ, done by someone who believes in the heresy of Christ not knowing He was God until that moment, from a Catholic one, which depicts the humility of Christ in the Presence of the Trinity from all time. All types of hints show us the beliefs of painters. To show Christ as an Arab is absolutely wrong. He was a Jew and still is as Man of that ethnic group. There is no such thing as a "cosmic Christ" or a Chinese Christ. That Mary has appeared to some as a member of an ethnic group has to do with God allowing Mary to appear to the senses of the person who is witnessing the apparition. So, Our Lady of Guadalupe reveals Mary as an Aztec princess, with many symbols and images to show she is the Mother of God. But for a Western painter to show Christ as someone other than He is begs the question of whether this artist actually has a relationship with Christ. Now, missionaries may show Christ as an Inuit Baby in the Manger, but at some point, they would teach Christ as in the line of David, of the Royal House, with a genealogy which includes some Gentiles, like Ruth the Moabitess. To deny Christ's Jewishness is racist at worst and mythology at best. For artists to take chances or push the envelope regarding the depictions of Christ and His Mother seems not to be the reason for painting. Painting is an act of prayer, or adoration. Those who paint icons know this. One goes to Mass, Adoration, prays and fasts before "writing" an icon. Sadly, EWTN missed a great opportunity for teaching about the God-Man, about the Incarnation and the truths of the New Testament times in the series of new paintings in the mysteries. I hope never to see them again. Some are actually disturbing in their falsity. Some are misguided attempts to be inclusive. Some are just not "good" art and many have left the 2,000 year heritage of images and symbols at our command, our shorthand in painting. Father Z. just highlighted a magnificent print depicting the Wedding Feast at Cana in Japanese terms. But, the real symbolism is still there. The artist has not changed the role of Mary or Christ. There are six wine amphorae, shown as beautiful Ming-like ware. But, the spirit of the work is that of the Scripture passage. There is Christian imagery on the screen. Inculuration is not the same as distortion. EWTN is an American company. It ministers around the world, but mostly to the English speaking world. I could bet that most of those who watch EWTN are Americans. I cannot understand dropping centuries of richness for the sake of appeal. It does not work. Read today's Gospel again on Christ saying that those who have faith in Him are more blessed than the physical bearing in His Mother's Womb. But, think differently on this. Think like St. Augustine, whose sermon on this passage reminds us that Mary bore Christ through Faith, not through the physical relationship with a man. Christ, the Word of God, entered Mary, and all who listened are blessed, though not in the degree Mary is. Mary's obedience in faith at the Annunciation brought forth the "yes" to the Incarnation. St. John Paul II echoes this in Redemptoris Mater. Mary's relationship with Christ is of the order of perfection, the unitive state to the utmost degree. As fully perfect from her Incarnation, Mary had no sin, no concupiscence and no effects of Original Sin. I make a plea to EWTN, which in view of the Teaching Magisterium, depicts Mary as not perfect and not Ever-Virgin. I was visiting someone who has EWTN on their cable television. When the rosary came on, I was asked to join the woman and I said, of course, yes. However, by the end of the rosary, I was saddened and disturbed to the point where I have to write this post. Some of the art used to depict some of the mysteries include heretical references. In other words, the paintings are "Protestant". Now, a Catholic knows the Gospel and the teaching of the Church regarding Mary. I want to clarify and argue against some of the depictions of Mary in the art used by EWTN. First of all, I shall start with the most obvious and the least complicated. In all of the apparitions of Mary, the saints who saw her said over and over that she was the most beautiful woman they had ever seen. Some of the artwork in the EWTN mysteries shows Mary not only as not beautiful, but plain and even ugly. This is contrary to almost 2,000 years of iconography and paintings, sculptures and friezes of Our Lady. To depict her as ugly or plain is not in keeping with tradition with a small t, nor with the wisdom handed down within the Catholic culture. Nor are the paintings in keeping with the approved apparitions, even Fatima and Lourdes, where the saints said that the Woman was beautiful. 34. Such a wealth of praise, built up by the different forms of the Church's great tradition, could help us to hasten the day when the Church can begin once more to breathe fully with her "two lungs," the East and the West. As I have often said, this is more than ever necessary today. It would be an effective aid in furthering the progress of the dialogue already taking place between the Catholic Church and the Churches and Ecclesial Communities of the West.86 It would also be the way for the pilgrim Church to sing and to live more perfectly her "Magnificat." My second point of contention, which is much more serious to consider, is that Mary is an Ever-Virgin, before, during and after the Birth of Christ. In some of the paintings on EWTN, Mary is seen doing the breathing exercises for birth and has a midwife. There was no midwife and Mary did not experience a natural Birth of Christ, but a supernatural Birth. I was shocked, and so was the older woman, in her eighties, sitting next to me. She said, "I was taught Mary was in ecstasy". I agreed, and said that was the teaching I received as well. These several depictions of the midwife are scandalous, as is the specific on showing Mary doing the birth-exercises for breathing. This is a Protestant view of the Virgin Birth. Protestants do not understand the way of perfection on this earth, which is why they do not honor Mary or other saints. They do not understand the Mystical Marriage. As I was taught in school and in theology class, through the long teaching of the Church, Mary's hymen was never broken. Christ miraculously was born, and Mary was in ecstasy when the Incarnate God came into the world. Many taught pre-Vatican II heard this in grade-school and in high school, if not college. Catholics always understood her as the new-Eve, not experiencing the curse of Genesis 3:16, To the woman also he said: I will multiply thy sorrows, and thy conceptions: in sorrow shalt thou bring forth children, and thou shalt be under thy husband' s power, and he shall have dominion over thee. The earliest painting, and most in the Medieval and Renaissance show Mary in contemplation at the Birth of Christ. She did not need pain management techniques. The Birth of Christ was miraculous. Mary was free of Original Sin and all its consequences. That is one reason we celebrate today, the Assumption. She was freed from corruption in any way. from Mystici Corporis Christi, Pope Pius XII. from Ineffabilis Deus, from Pope Pius IX, on Mary's body being inviolate. As if these splendid eulogies and tributes were not sufficient, the Fathers proclaimed with particular and definite statements that when one treats of sin, the holy Virgin Mary is not even to be mentioned; for to her more grace was given than was necessary to conquer sin completely. They also declared that the most glorious Virgin was Reparatrix of the first parents, the giver of life to posterity; that she was chosen before the ages, prepared for himself by the Most High, foretold by God when he said to the serpent, "I will put enmities between you and the woman. "-unmistakable evidence that she was crushed the poisonous head of the serpent. And hence they affirmed that the Blessed Virgin was, through grace, entirely free from every stain of sin, and from all corruption of body, soul and mind; that she was always united with God and joined to him by an eternal covenant; that she was never in darkness but always in light; and that, therefore, she was entirely a fit habitation for Christ, not because of the state of her body, but because of her original grace. To these praises they have added very noble words. Speaking of the conception of the Virgin, they testified that nature yielded to grace and, unable to go on, stood trembling. The Virgin Mother of God would not be conceived by Anna before grace would bear its fruits; it was proper that she be conceived as the first-born, by whom "the first-born of every creature" would be conceived. They testified, too, that the flesh of the Virgin, although derived from Adam, did not contract the stains of Adam, and that on this account the most Blessed Virgin was the tabernacle created by God himself and formed by the Holy Spirit, truly a work in royal purple, adorned and woven with gold, which that new Beseleel made. They affirmed that the same Virgin is, and is deservedly, the first and especial work of God, escaping the fiery arrows the the evil one; that she is beautiful by nature and entirely free from all stain; that at her Immaculate Conception she came into the world all radiant like the dawn. For it was certainly not fitting that this vessel of election should be wounded by the common injuries, since she, differing so much from the others, had only nature in common with them, not sin. In fact, it was quite fitting that, as the Only-Begotten has a Father in heaven, whom the Seraphim extol as thrice holy, so he should have a Mother on earth who would never be without the splendor of holiness. All other titles attributed to Our Lady are based on her vocation to be the Mother of the Redeemer, the human creature chosen by God to bring about the plan of salvation, centred on the great mystery of the Incarnation of the Divine Word. In these days of festivity we have paused to contemplate the depiction of the Nativity in the crib. At the centre of this scene we find the Virgin Mother, who offers the Baby Jesus for the contemplation of all those who come to adore the Saviour: the shepherds, the poor people of Bethlehem, the Magi from the East. Later, on the Feast of the "Presentation" which we celebrate on 2 February, it will be the elderly Simeon and the prophetess Anna who receive the tiny Infant from the hands of his Mother and worship him. The devotion of the Christian people has always considered the Birth of Jesus and the divine motherhood of Mary as two aspects of the same mystery of the Incarnation of the Divine Word, so it has never thought of the Nativity as a thing of the past. We are "contemporaries" of the shepherds, the Magi, of Simeon and of Anna, and as we go with them we are filled with joy, because God wanted to be the God-with-us and has a mother who is our mother. All the other titles with which the Church honours Our Lady then derive from the title "Mother of God", but this one is fundamental. Let us think of the privilege of the "Immaculate Conception", that is, of Mary being immune to sin from conception: she was preserved from any stain of sin because she was to be the Mother of the Redeemer. The same applies to the title "Our Lady of the Assumption": the One who had brought forth the Saviour could not be subject to the corruption that derives from original sin. And we know that all these privileges were not granted in order to distance Mary from us but, on the contrary, to bring her close; indeed, since she was totally with God, this woman is very close to us and helps us as a mother and a sister. 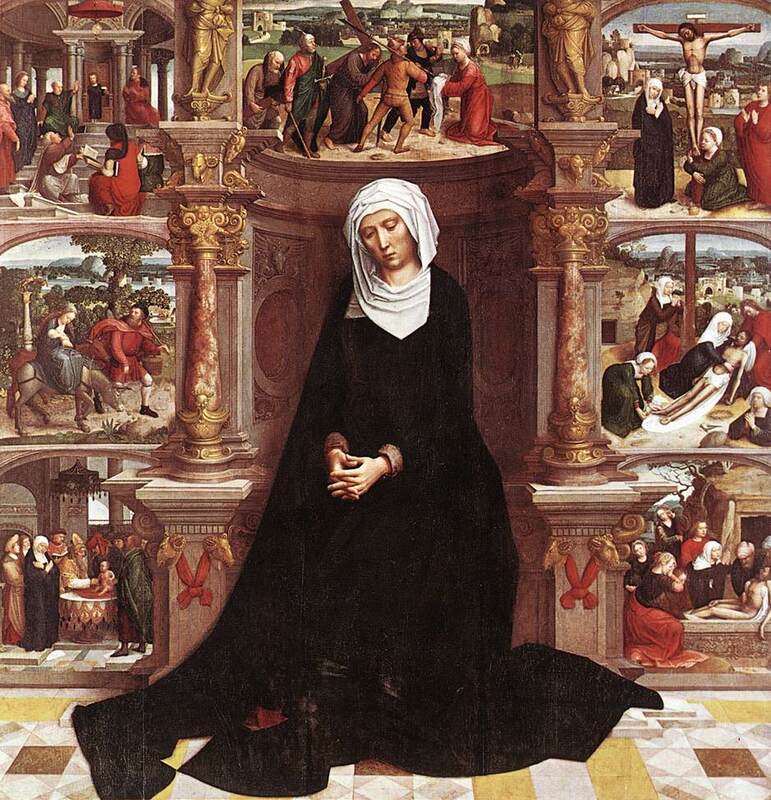 The unique and unrepeatable position that Mary occupies in the Community of Believers also stems from her fundamental vocation to being Mother of the Redeemer. Precisely as such, Mary is also Mother of the Mystical Body of Christ, which is the Church. Rightly, therefore, on 21 November 1964 during the Second Vatican Council, Paul VI solemnly attributed to Mary the title "Mother of the Church". One may also look at the Councils of Ephesus and Lateran. Here is the CCC section to look up. I read footnotes. I appeal to EWTN to remove the artwork which contradicts the teaching of the Church on Mary's complete virginity and the depictions of her as anything but beautiful. to be continued...there are other issues as well with some of the other mysteries. "The Korean Church is unique because it was founded entirely by lay people. This fledgling Church, so young and yet so strong in faith, withstood wave after wave of fierce persecution. Thus, in less than a century, it could boast of 10,000 martyrs. The death of these martyrs became the leaven of the Church and led to today's splendid flowering of the Church in Korea. Even today their undying spirit sustains the Christians in the Church of silence in the north of this tragically divided land" (Saint John Paul II, speaking at the canonization of the 103 martyrs, 1984). .See this website for more information. 103 were canonized in 1984 by St. John Paul II, who also visited Korea. The Litany of Loreto The Second Sorrowful Mystery The Scourging at the Pillar John 19:1-5. Our ... Mother of the Suffering Christ, pray for us that we may not be afraid of the sufferings of our lives, of our friends, of our relatives. The Litany of Loreto Rosary The Third Sorrowful Mystery The Crowning of Thorns John 19:23. Our Father Mother Mary, enlighten our minds that we may understand deeply the significance of Christ's Passion in our lives. The Litany of Loreto Rosary The Third Glorious Mystery The Descent of The Holy Spirit. Acts 2:1-3. Our Father. Come, Holy Spirit Come. Hail Mary one. Philippians 1:14. And the greater number of the brethren in the Lord, gaining courage from my chains, have dared to speak the word of God more freely and ... She was pure from the first moment of her existence, as a tiny creature in her mother's womb, free from an concupiscence, from all impurities, from Original Sin. The Litany of Loreto Rosary Part 15-The Glorious Mysteries-The Fourth Glorious Mystery, The Assumption. Posted by Supertradmum. The Litany of Loreto Rosary The Fourth Glorious Mystery The Assumption Our Father Glorious Virgin, stir up the virtue of faith ... all inherit from our mothers and fathers. Mary, the Immaculate Conception, was born free of all fault, either physical, psychological, or spiritual, so that she would be the perfect Mother for the perfect Son of God. I have not written any poetry since I moved, since I left the Midwest. I was thinking about that this evening. Some places are more conducive to writing poetry than others. Interestingly, sometimes I write poetry months after an event, not during. Such is love and sorrow-it may become more understandable in reflection. But, again, geography affects my poetry genes. It is too quiet here. There are no cicadas singing at night. There are no tree frogs. I have only heard two different owls, once each, in a month, and one mysteriously chirping bird on one morning; a bird which sounded like the peal of bells. I was so excited I listened for the entire half-hour as it sang its evocative song. For forty years, I kept a bird diary and I memorized bird songs. I have no idea what bird blessed the air with its change-ringing. Now, it is too quiet. I only have one small patch of sky above me, as I am in the forest. I cannot write about my beloved stars. These elude me, hiding in the arms of the trees. The sky is dormant in clouds and rain during the day. But, Dublin rain inspired me, as did London rain. This north country rain does not inspire me. It makes me cold and wet. At night, the trees in the forest seems like the ones described in my children's book, Heidi, with the wind in the pines and firs magnified by the tall trees. I call this Heidi's Grove. But, there is no kindly grandfather. I miss my duvet, a word not known here. I did not bring a feather bed, as I had no idea that Summer and her train of flower-maidens had left this area in disgust and walk in the southern lands far from these dark lakes and tumbling rocks, like the Entwives, seeking a better home. It is too dark for me to take a walk at night down to the closest lake, as I have no chaperon, and this is a wild land. It is not the animals that are wild, as they are in the dark forest, not by the lake. The wild ones are the strange people who come and go like ghosts camping on the edges. They come from the past and live in the past and have no poetry. Their camps are ghost camps, with ghostly fires, and ghostly sounds. I have met people with no poetry in their bones or souls. They sit in front of campfires with old boomboxes spewing out 1980s music, as if time has stopped here. In fact, where I am staying, all the clock are broken. I tried to change the batteries, but none work, and there are many, many clocks, gathering dust, caught in a gloom of Miss Havesham's house. Estella. : 'Yes,' she replied; 'but it meant more than it said. It meant, when it was given, that whoever had this house, could want nothing else. They must have been easily satisfied in those days, I should think. Some people seem satisfied without poetry. Perhaps, I write better in more domestic or urban atmospheres. In County Meath, I wrote tons of poetry a few years ago in a small town punctuated with roses, roses, roses, and the red moon. I could see the road running down to Cnoc na Teamhrach. And I have written in England, the land of poetry, in a small room near the Surrey Hills, with the sound of robins in the hedge purposefully getting me off tack, and the scent of the sea springing over the hills like the young lambs, full of life and joy, gamboling, reminding me of the stomping feet of the dancers around East Coker. I know why T. S. left Harvard. Perhaps I need the mists and the sea. Perhaps, I need the sound of church bells, or the blackbird. Perhaps, I need a certain domesticity, like walking to Mass, coming home for a coffee and croissant, getting the post, praying at regular hours, studying at regular hours, cleaning at regular hours, walking to a sunny place and corner shop to say hi to friends, going to the small, dim chapel for Adoration where the old nuns sleep; and, me, sleeping when the sun goes down and rising when it rises. The trees hide the sun here. I cannot see it rise or set. And, my bell-bird has left me. My mother is a St. Louis girl and I wrote a poem long ago about her. It was published. She once said to me that she loved the big cities as one could be anonymous. Perhaps, I need anonymity, which one does not find in a hamlet where everyone knows everything about everybody back a hundred and fifty years. I am the stranger, which is fine, but strangers are not welcomed in the big tree country, not even as staying strangers. We are suspect. Maybe I am suspect because I might write a poem about the hamlet, about the hatred of strangers, which I see is really the fear of people who are not their own. Not having poetry breathing forth from my soul is like breathing with one lung. Perhaps, the air is too rarefied here, too high, in these foothills. This is not a land of poetry; it is a land of action, hunting, fishing, striving, sitting without thought at the end of an endless day with a weak beer. But, even my ancestors on the hard-working prairie played the violin and read Jungmann in the twilight. I shall have to go to a land of poetry. I can write in pubs and in country houses where there is a rhythm of life. I can write in London, or any place where history crawls up and strokes its back on my legs and feet, wanting attention and love. I can write by the Middle Sea, where the waves crash into the rocks seen by Turgut Reis. Perhaps, it is this lack of history. In some of these forests surrounding my view, no man or woman has ever walked. Perhaps, it is the lack of resonance with any past which stops my words. But, when in Alaska, God's own country, more remote and detached, I could see poetry pouring out of Kenai River, on the backs of the Sockeyes, but not here among the balsam fir and red spruce. The Benedictines moved to the mountains and the Cistercians took the valleys. My home would be with the Cistercians, in-between the nursing arms of the rivulets, bouncing down the hills, like at Fountains. The Benedictines would climb these foothills to the mountains, and clear a place for a great monastery. But, none ever came here, only the lone Jesuits, carving out the sacred in the profane, leaving no tracks, like the wild boar I think visits the side of the house some nights. I know the smell of a pig. But, it leaves and trundles back into the wild, needled, red ground, a trespasser, like the Jesuits, who walked under these fir trees. The Blackrobes pierced the krummholz with the Kyrie eleison, and conquered the then unnamed Lampson Falls with preaching and the mumbling of Vespers, but they left no mark on this red, sandy earth. I can only write a short poem for now, a haiku. Bar the sun and sounds of grace. Well, as I am in the Dark Night, perhaps this is appropriate, like a pathetic fallacy. One can only wait for the sun and the sky to open up. I wonder if I shall find poetry in this place of firs and pines? Please pray for my blog. I am having terrible troubles with both the computer and the Net. Praise God in all things. I tried to attach this primary post at least twenty times to the Litany post. The problem may be the blog server.